Green Chrysanthemum on Marsh and AIWS Initiative – How will AI bring happiness to humankind? About 40 years ago, the play Green Chrysanthemum on Marsh by famous playwright, author and poet Luu Quang Vu left an indelible impression on the hearts of Vietnamese audiences. The play predicted the emergence of robots that were superior to humans, and presented the ethical and legal challenges that arise when people live together with machines. The author also warned about the use of advances in science and technology to serve selfish individual interests. The play also enquired about how Artificial Intelligence (AI) and robots could bring happiness to humankind. “Whosoever finds the green chrysanthemum on marsh will receive the gift of happiness” – Folk legends in the countryside have celebrated the young souls and forever re-lived the memory of the three main characters – Lien, Hoang, and Van – three students from a small green valley village school. They treaded the grassy marsh to gather green chrysanthemums believing that by doing this they would be happy for a lifetime. As they grew to adulthood, each of them achieved the career of their dreams. Lien aspired to become a teacher, Van dreamed of becoming a painter. Hoang wanted to be a talented engineer with innovations that could change the world. One day, Hoang planned to meet Lien to express his love. Ironically, Van and Lien also wanted to send him their wedding invitation. Unable to face the fact, Hoang created two robots identical to Lien and Van but with the most noble and idealistic of qualities. Robot Lien is charming, feminine, honest and sensitive. Her soul is teeming with innocence and love, filled with yesteryears and aspirations. Robot Van is a genius painter with an endless passion for the art. He loves righteousness, freedom, justice and integrity. Hoang created Robot Lien to love him only, and Robot Van to be a loyal, neutral, and subordinate friend. Robots Lien and Van are the embodiments of Hoang’s dream of happiness. But when Robots Lien and Van came into the real world, there were problems beyond what Hoang had anticipated. Lien Robot dreamed of having a handsome lover with the physique, clothes, and soul to match. Living with Hoang, she soon realized his selfishness, narrow-mindedness, jealousy, falsehood, flattering habits, and aggressiveness, along with the grinding of teeth while he slept. These frailties led her to lose affection for Hoang. When she told Hoang of her reservations, he was embarrassed and disappointed. Seeking to escape from him, Robot Lien went out to search for Robot Van and discovered that he was locked inside the basement to paint and fantasize. The two of them ran away, only to encounter difficulties. Robots Lien and Van looked exactly like the real Lien and Van, creating misunderstanding and confusion. Hoang has told authorities that Robots Lien and Van were a danger to public security, which led authorities to set up a special committee to find them. Confusing situations and grim distractions occur when the robot and real Liens and Vans encountered each other. Hoang followed Robots Lien and Van back to the valley of childhood and saw them sink into the marsh. Through these developments, the real Lien and Van came to realize that their love and happiness rested on respect and the act of daily living. Hoang came to realize that dreams will only be beautiful and long-lasting when people maintain a pure and innocent heart. The moral of the play: individuals must not allow themselves to sink into the swamp of selfish mediocrity. Many famous playwrights of Vietnamese theater have presented the play, including People’s Artist Nguyen Dinh Nghi and Eminent Artist Do Ky. In January 2018, when the Youth Theater staged this play, I was the director and felt under great pressure but saw it as an opportunity to stage the play of the greatest writer in Vietnam: Luu Quang Vu. I thought about an innovative approach because the audience of the AI era is different. The challenge was how to create a fresh, youthful, and modern appeal that could draw people to the theater. I advocated the use of many new tricks to break the boredom of the “box stage” – for example, pushing the fantasy element to a higher level of space and time to take the imagination beyond the present. The new theatrical method helped viewers to feel the breath of contemporary life as AI has become increasingly visible. The play’s staging was also adjusted. The horizontal and vertical lines on the background contrasted perfectly with the subtle symbol of a green chrysanthemum, creating a sense of fierce opposition. Cutters ran on stage with sparks to slice through the imaginary space of fragile boundaries. The talent and dedication of the young actors made an important contribution to the success of the play. Participating in the National Professional Theater Competition in April 2018, the play won the Gold Medal. Innovations were done in acting, but we have kept the same pioneering, forward-looking vision that embodies the profound human values of the script. The vital message that the play Green Chrysanthemum on Marsh conveyed to the viewers is this: Is it time for robots to replace humans? And what distinguishes man from machine? Robots could become more intelligent, even more perfect than human beings. How can people live harmoniously with them? What do people need to do to adapt and to retain human values? Along with the Green Chrysanthemum on Marsh, over 50 other plays by the famous writer Luu Quang Vu, such as Truong Ba’s Soul, Butcher’s Body, Me and Us, Thing Cannot Lose, and The Ninth Oath, and Ms. SiTa have contributed to the spurring of innovation in Vietnam. His plays dealt with the hottest and toughest issues of reality after the War. They were hindered by the centralized subsidy mechanism, which was a proper management mechanism during the War but a barrier of development in peacetime. It caused rigid habits and ideologies that retarded society’s development. Through these plays, Luu Quang Vu criticized the bureaucratic evils: the dogma of the people clinging to the old and being afraid of the new. Simultaneously, he also exposed, cheered for new trends, praised and dared pioneers to think, do, and take responsibility. He explored the core issues of reality and expressed them vividly on the stage, then sent out prognostic messages about the new beginnings. Luu Quang Vu ushered in the golden age of the Vietnamese stage in the late twentieth century. His plays were well received and widely welcomed. With great spirit and innovation in his work, he “ignited” the young Vietnamese generation in the Early Renewal Period. Believing in love, they eagerly embarked on new jobs and societal contributions. Luu Quang Vu contributed greatly to the country’s transformation. He was a brilliant pioneer of the Vietnamese people during the eve of the Renewal Period. The Vietnamese people love and acknowledge his contributions. In 2018, during the 30th anniversary of their passing (Luu Quang Vu; his talented wife, Ms. Xuan Quynh; and their beloved son, Luu Quynh Tho) into the realms of immortality after a tragic accident, the literary public is grieved in remembering them. Several activities of remembrance and gratitude were organized. The disruptions caused by writer Luu Quang Vu have been addressed by creators and innovators at the Michael Dukakis Institute for Leadership and Innovation (MDI) in Boston, US through the Artificial Intelligence World Society (AIWS) Initiative. Aware of the opportunities and challenges that AI brings to humanity, the MDI announced the AIWS Initiative in November 2017. The AIWS Initiative is a collection of concepts, ideas, and solutions that appeal to governments, technology groups, academics, universities, lawmakers, and others. It aims to establish a moral foundation, a legal framework, and to establish an AI Society. In addition, it proposes the establishment of a committee of standards to monitor and supervise research and application of AI processes to real-life processes towards a safe and prosperous world with noble human values. The work of the Boston Global Forum (BGF) and the MDI is inspired and led by the scholar Nguyen Anh Tuan – CEO of the BGF and Director of the MDI, Founder and former Editor-in-Chief of VietNamNet Newspaper – along with former Massachusetts Governor Michael Dukakis, who was the Democratic Party nominee in the US Presidential Election in 1988. The AIWS Initiative, which represents a pioneering vision at the dawn of AI, has attracted the attention of AI professionals, academics, research institutions, and technology firms around the world. Many AIWS conferences have been held at Harvard University to gather the essentials of AI from Harvard University, MIT, and other US universities. An AIWS conference was also held in Tokyo and attracted top Japanese AI experts. In June 2018, the first concept of the AI-Government, which was announced by MDI at Harvard University, is being promoted by BGF in concert with the United Nations. On August 9th, 2018, top US newspapers such as the New York Times, the Washington Post, the Boston Globe, the Chicago Tribune, the San Francisco Chronicle and the ABC News were proud to present the AIWS and the AI-Government. 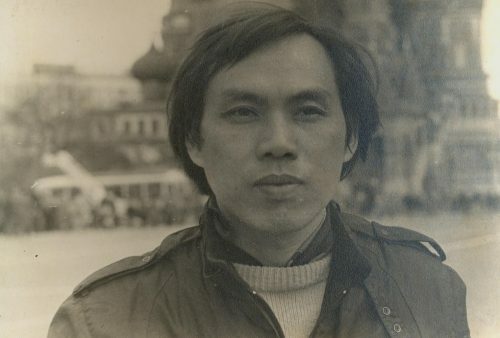 Nearly 40 years ago, Luu Quang Vu, through the play Green Chrysanthemum on Marsh, predicted the emergence of a society where AI robots co-exist with humans, posing unique problems and challenges. Thirty years ago, on August 29th, 1988, Luu Quang Vu died at the age of 40 to the great sorrow of the Vietnamese people. 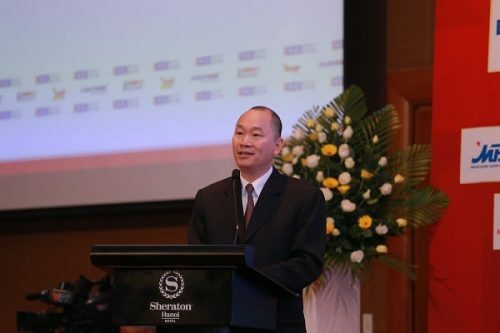 In 2018, on the 30th anniversary of his departure, there was a global pioneering initiative – an AI world society as proposed by Vietnamese scholar, Nguyen Anh Tuan. The coincidence in thought between the authors of Green Chrysanthemum on Marsh and the AIWS is the harmony of great minds whose souls are filled with love and passion for humankind. * Thanks for the contribution of Ms. Thu Cuc.